The courses will start with a theory part followed by one or more day in the water. This is the course for beginners, the candidate will be test in the water to be sure that he or she posses the basic necessary freediving skills. In the theory part: Freediving techniques, equipment, safety and proper basic fishing technique will be discussed. Than we go in the water; fishing grounds are specially selected for the beginners, shallow waters rich in catches and one on one instructions will be the ingredients for a successful first day of fishing and the base for future improvements. This is for the spearfisherman that has some experience already but wants to improve his technique and catching abilities. In the water the student will be assisted personally and the election of the fishing ground will be specific depending on the season, ability and targeted species. This is going to be attended by the expert spearfisherman that wants to be sure that his or her ability will be used at the best in the local fishing ground targeting the most valuable species in a full day in the water with the one on one assistance of our professional. The course will be, every time, customized on the specific needs and ability of the student. 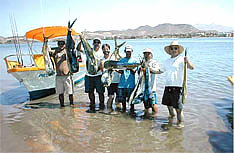 Naturally there will be plenty of spearfisherman that will not feel the need for taking part in a course ( doesn’t matter at what level) and they will just need the guiding and expertise to be sure to be able to get the most profit by their spearfishing holidays, in that case The Mosquito Fleet will offer the best guiding available for a successful hunt.